I grew up in Torrenueva, a small town in Spain close to Granada. Since I was a child I always wanted to become an artist and probably it all started when I watched Pinocchio for the first time. I really wanted to recreate that magic with my pencils and from that moment I spend so many hours drawing! I went to an art school and I have a Bachelor Degree in Interior Design and Animation, but I have also learned a lot (and I keep learning everyday) by constantly experimenting with my art and by looking at the the work of the artists that I admire. I really didn't have any problem to let my family understand my love for arts. After all, my mom was an artists herself.. I was a lucky guy! I was born in 80's, a good decade for animation shows. Don Bluth, Disney, Miyazaki, Hanna & Barbera and many others were such a great influence to me. Movies like Pinocchio, Cinderella, The Secret of Nimh, The Little Mermaid, Akira, My Neighbour Totoro or tv series like Duck Tales, Sherlock Hound, Saint Seiya, Dragon Ball or Moomins were truly amazing references, both in terms of styles and storytelling. As a kid I loved to draw Disney characters and I still do. Today though, I don't try to simulate the Disney style anymore, I prefer to recreate them with my personal touch. From the initial client idea to the final work: what goes through your mind when you are designing? Well, it depends. Without getting to much into details, sometimes clients ask me to create something in a particular style and in that case I'm definitely less free to do what I want. But sometimes they give me complete creative freedom.. and those are the project I enjoy the most! Working with other artists has definitely improved my drawing and colouring technique. Group projects in particular are the perfect occasion to sharp your artistic skills. Some illustrations are among my favourites because they made me win art contests or simply because performed very well on social media, my first short film "Origami" and my Mad Max and Peanuts fan arts were all well received online. Of course I have also many other artworks that I love on a more personal level. In the past I have worked for DisneyParks, Barbie, BBC and Harper Collins. At the moment I'm working in a very interesting project for Disney and I'm also designing a new children book. 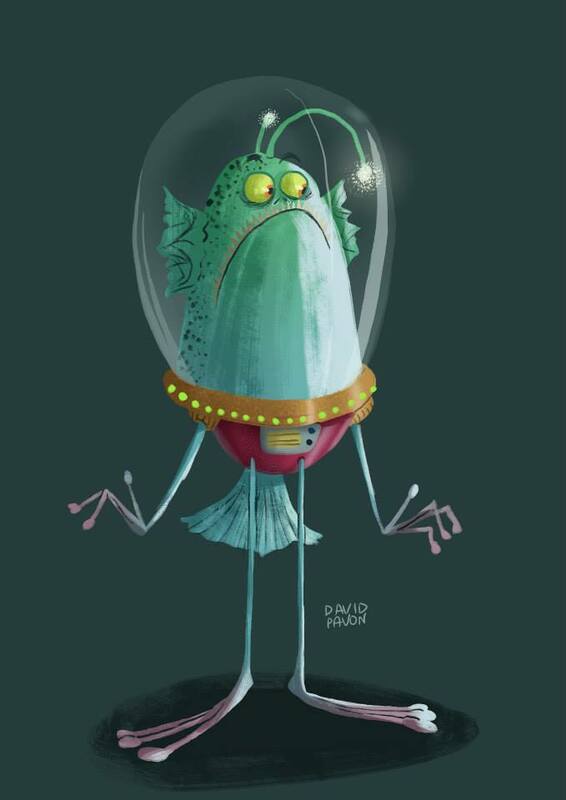 I would certainly love to work in a Disney/Pixar movie project as a character designer or as a concept artist. As I mentioned above, working for a company for a while would be really good for me, but in the future I would like to keep my family and friends close to me, so freelancing would be my choice. Most of the time you find yourself struggling with an art block for one reason: you are too focus on something and that can stress you. In that case you need to do different things and forget about your art for a few days. Enjoy yourself: visit an art exhibition, travel, talk with other people, check out a good art book for inspiration. At the beginning of your career you find yourself working on many different projects, you want to make a living as an artists and this will push you out of your comfort zone. This can be an excellent occasion to experiment with your art: with the time and a bit of experience the answer will naturally come to you. Some of my favourite art books are the ones about animation movies (Ratatouille, The Lion King, Pocahontas or Cloudy with a Chance of Meatballs just to name a few). I also love books about the work of artists such us Eyvind Earle, Maurice Noble and Mary Blair, but if I had to recommend only one, I would go for "Blacksad". This comic series is such an incredible work of art: the colors, the characters, the settings and the story itself, everything is perfect. Juanjo Guarnido is the best! I try not to think about this too much. I prefer to take the opportunities that life brings to me everyday and enjoy my life. When I'm working on something I always give my best. If one day I will receive an email asking me to be a part in the next Pixar movie I'll be ready for it. I'm an hard worker and I want to reach my goals, but I don't want to be obsessed with them. Nowadays, thanks to the internet, I have a lot of artists that I love: Joey Chou, Glenn Keane, Peter de Seve, Cory Loftis, Mingjue Helen Chen and Nico Marlet just to name a few. I hope to see more 2D animation movies in the near future. I have great expectations for "Klaus", the upcoming animation project of the SPA Studio. Crowd funding proves that the industry sometimes lack vision for innovation, many great projects come to life today only because of crowd funding. If you are lucky enough to have a good idea and a large audience that follows you, you can really make things happen. You can follow me on my Twitter and Facebook page and I have an online shop that you can visit HERE. For commissions feel free to drop me a line at davidpavonbenitez@gmail.com . I also have two art books for sales HERE if you are interested.